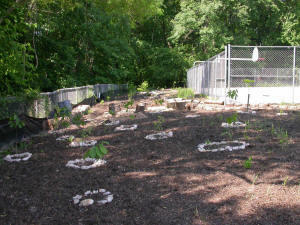 Daniels Run Elementary School in Fairfax, Virginia, is our organization’s pilot school and serves to demonstrate an environmental educational program closely linked with conservation projects on school grounds. LANDS and WATERS' educational stories provide the foundation for the classroom environmental instruction. 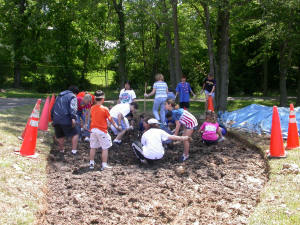 The accompanying hands-on activities provide the foundation for the living classroom. Each year, Daniels Run's living classroom is expanded or enhanced. Currently, eleven conservation projects are demonstrated within the living classroom. Let's take a look at some of these projects. Eroded stream bank, Daniels Run Stream. 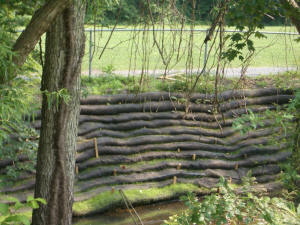 Installation of Filtrexx soxx to stabilize stream bank. As Fairfax City became more developed, the amount of impervious surface in the city increased causing enormous problems for city streams and eventually for the Chesapeake Bay. 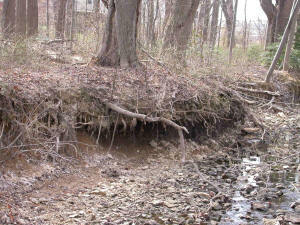 One of the main impacts was the erosion and destabilization of stream banks. 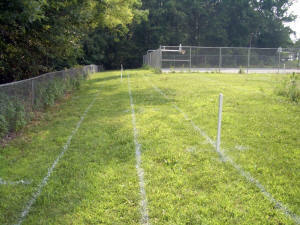 In 2006, we partnered with Daniels Run School, the City of Fairfax, and Filtrexx International to install an innovative technique to stabilize a portion of the stream banks on school property. This was the first time the Filtrexx soxx technique was used in Fairfax County. Riparian buffers are areas adjacent to bodies of water which act to intercept pollutants associated with stormwater runoff. These areas provide wildlife habitat, increase biodiversity, and act as corridors in urban environments. The picture on the left shows the degradation of a riparian area. Turf grass has replaced the natural forest yet does very little to filter and absorb stormwater runoff. It does not provide habitat or biodiversity. 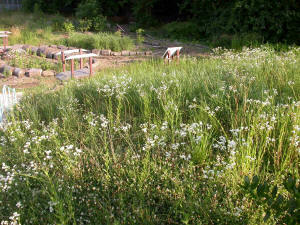 Students and volunteers replaced the turf grass with native plant communities typically found in riparian areas. In time this area will be able to provide the benefits associated with a healthy riparian area. 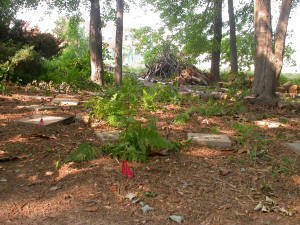 Pollinator garden area before restoration. 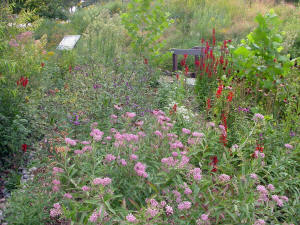 Pollinator garden in second year of restoration. As the land around us becomes developed, we change the natural environment into impervious surface areas and usually manicured lawn. In doing this, we greatly reduce and fragment wildlife habitat. Ornamental plants from other parts of the world replace native species. Unfortunately these ornamental plants do not adequately provide the elements of habitat (food, water, shelter, a place to raise young, and clean air) for wildlife. One of the species that has suffered from urbanization are pollinators. Pollinator populations have dropped significantly. This an alarming fact when you consider the importance of pollinators for the production of food. 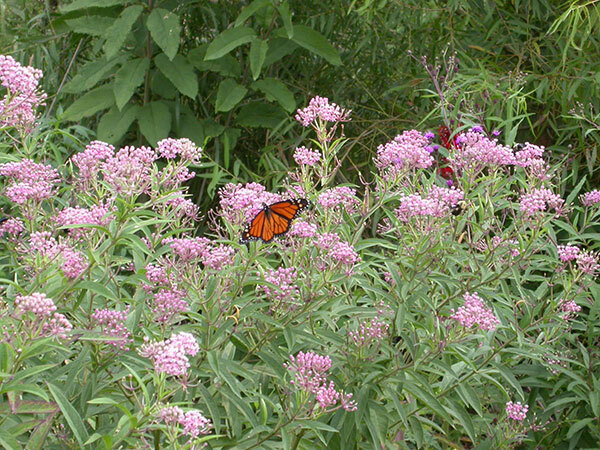 By creating pollinator gardens we are helping replace some of the habitat that is being lost to urbanization. The following list outlines guidelines for creating a pollinator garden. Plant plenty of nectar- and pollen-rich flowers. Provide food sources (host plants) and overwintering places for eggs and larvae. Provide water (shallow pools, mud puddles, and bird baths). Provide sites and materials for nesting and overwintering. Edge area with educational signage. 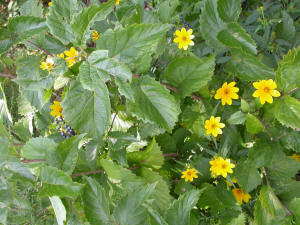 Native edge plants showing black berries of the arrowwood viburnum, a excellent edge and understory bush. In a natural setting the transition from the lower growing meadow plants to the forest is gradual. This area of gradual transition is called the forest edge. The forest edge is an important source of food and shelter for wildlife and hosts a great diversity of native plants. Unfortunately, edge areas are often lost during the urbanization process. We have restored an edge area to illustrate this important ecological feature. 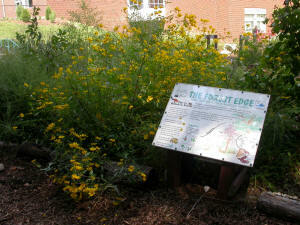 Edge gardens provide a healthy transition from meadows to forests. Hillside in second year of restoration. 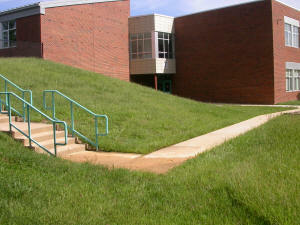 The slope of this hill was increased after Daniels Run School was remolded. Turf grass was planted to control the erosion of soil from the hillside. This reduced erosion to some extent but not entirely and did nothing to help slow down the flow or reduce the volume of water during a rain event. Turf grass is a monoculture that provides very little or no wildlife habitat opportunities. In order to reduce and filter stormwater and to increase biodiversity and habitat, students and volunteers planted this hillside with a variety of native grasses. This has eliminated soil erosion and provides food and shelter far a wide variety of birds and pollinators. 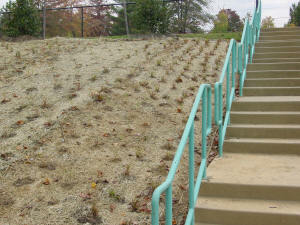 The sponge garden was created at the bottom of this slope to capture and filter stormwater runoff. Students, teachers, and volunteers are shown here mixing sand and leaf compost into the original clay soil to enhance the soil's capacity for retaining and filtering water. We coined the phrase sponge garden to describe a simple water retention area without many of the engineering features found in rain gardens. There are two sponge gardens in our living classroom both function to retain the water runoff from paved and grassy sloped areas. After excavating, we mixed the original clay soil with sand and leaf compost to improve water retention. 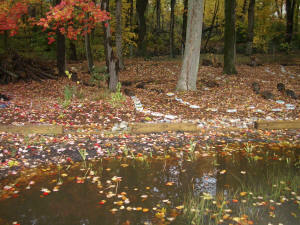 Lastly, we planted native plants that would tolerate both dry and wet conditions. Sponge gardens provide multiple benefits including stormwater control, increased biodiversity, and expanded wildlife habitat. There is an engineered rain garden demonstrated in the living classroom. This facility captures rooftop runoff from a portion of the school building and includes such engineered features as an under-drain and engineered soil mix. This image shows the beginning restoration of the forest understory. A brush pile is visible in the back of the picture created to provide shelter for wildlife. 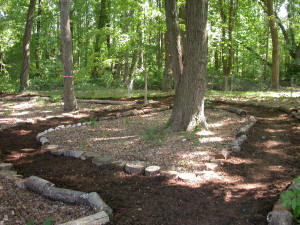 Paths have been developed throughout the living classroom. Often visitors from the surrounding neighborhoods enjoy strolling the paths after school hours. 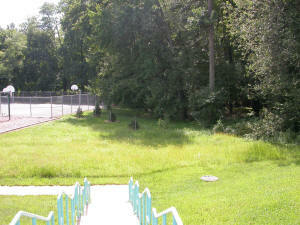 The forest areas at Daniels Run School were overgrown by invasive plants, mostly English ivy. This invasive vine covered the forest floor and climbed up the canopy trees. Over time invasive vines will kill trees. Our first step towards restoring the forest was to remove the invasive plants and replace them with native plant communities. It is important when restoring forest areas to plant understory species along with canopy trees. 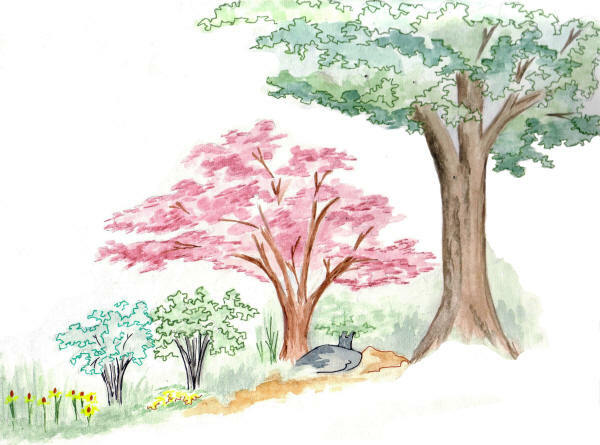 Understory plants include smaller trees like dogwoods, bushes like viburnums, and the lower perennials like Christmas ferns. Images shows the area where water overflows to fed the natural wetland. 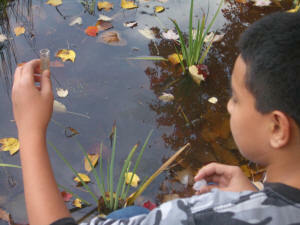 Student examining water from the wetland during a water testing activity. A natural wetland exists adjacent to Daniels Run Stream. As surrounding areas were developed larger and larger amounts of water flowed into the stream, causing the stream bed to deepen. The wetland became disconnected from the stream that once fed it and lost its ability to function properly. Please contact Jeanette Stewart if you wish to schedule a tour of the living classroom of Daniels Run School.